Vande Burgt, N. H., Cocka, L. J. and Bates, P. (2013). HIV-1 Virus-like Particle Budding Assay. Bio-protocol 3(14): e830. DOI: 10.21769/BioProtoc.830. Viral replication culminates with the egress of the mature virion from the host cell. This step of the viral life cycle has recently garnered increased attention with the discovery of the cellular restriction factor, Tetherin, which tethers budded virions to the surface of infected cells and inhibits viral spread. The importance of this block in viral infections has been suggested by the discovery of viral antagonists, such as HIV-1 Vpu, which counteract Tetherin. This protocol describes a system to study HIV-1 budding under BSL-2 safety conditions. It takes advantage of the ability of many viral matrix/capsid proteins to generate non-infectious virus-like particles (VLPs) with the expression of a single viral protein (i.e. HIV-1 p24 Gag). This protocol was recently used to characterize the effect of Tetherin isoforms on VLP release in the presence of HIV-1 Vpu (Cocka and Bates, 2012). Simultaneous expression of Tetherin and other viral antagonists can be used to study Tetherin-mediated restriction on viral budding. Plate 293T cells in 500 μl of Cell Culture Media at a concentration of 2.5 x 105 cells/well in a 24 well plate. Cells should grow to 70-80% confluence 18-24 h post-seeding. For the following transfection, the amounts of plasmid DNA have been optimized for this protocol. Transfect seeded cells with 50 ng of psPAX2, an HIV gag expression vector, using Lipofectamine 2000. Follow the manufacturer’s protocol using a ratio of Lipofectamine (μl):DNA (μg) of 2.5:1 diluted in OPTI-MEM. Aspirate the transfection reagent from the transfected cells 5 hours post transfection and add 500 μl fresh Cell Culture Media. Incubate at 37 °C and 5% CO2 for 36-48 h.
Alternatively cells can be transfected with any other vector expressing a viral matrix/capsid protein, such as Ebola VP40 (Kaletsky, 2009) that can produce virus-like particles (VLPs). The effect of the cellular restriction factor Tetherin can be assessed by co-transfecting increasing amounts (10-200 ng) of the pCMV-SPORT6 Tetherin expression vector with a VLP producing plasmid. Viral antagonists of Tetherin can be studied by co-transfection of increasing amounts (25-100 ng) of a Tetherin antagonist such as pCAGGS HIV-1 Vpu along with a Tetherin and VLP expression plasmid. Harvest cellular proteins and purify VLPs. VLP analysis. 36-48 h post-trasnfection, pipet all of the media from each transfected well into individual 1.7 ml microcentrifuge tubes. Centrifuge at 1,700 x g for 2 min at 4 °C to clear media and pellet cell debris. Transfer 450 μl of cleared media by pipetting into individual 8 x 34 mm ultracentrifuge tubes and underlay with 100 μl of the 20% Sucrose Solution. Place ultracentrifuge tubes in a pre-chilled TLA 120.1 rotor and centrifuge at 40,000 rpm for 30 min at 4 °C in a refrigerated ultracentrifuge. Carefully remove and discard all of the media and sucrose underlay by pipetting. Be very careful, as the protein pellet is not clearly visible. Add 50 μl PBS to the protein pellet on ice and incubate for 1-24 h (1 h minimum). Cellular Lysate Analysis. After removing the VLP containing media, add 80 μl Triton X-100 Lysis Buffer to each transfected well in the 24-well plate and incubate for 5 min at room temperature. Transfer all of the lysate to a 1.7 ml microcentrifuge tube. Centrifuge at 17,900 x g for 3 min at 4 °C to pellet insoluble cell debris. Transfer 50 μl of the cleared lysate to new microcentrifuge tube for immunoblot analysis. Immunoblot Analysis. For each sample, either sucrose pelleted VLPs or cellular lysates, transfer 25 μl into a new 1.7 ml microcentrifuge tube. Add 5 μl of 6x protein gel loading buffer to each sample. Heat the samples to 95 °C for 10 min. Analyze the VLPs and cellular lysates on separate Criterion Precast 4-15% SDS-PAGE gels. Transfer gel to Western blot membrane and continue to immunoblot using the Blocking Solution. Immunoblot with an anti-p24 Gag antibody (1:10,000 dilution in Blocking Solution) to detect the VLPs and cellular p24 gag. Membranes can also be stripped and immunoblotted for other transfected proteins (Tetherin, Vpu) or housekeeping genes as loading controls (GAPDH). For example, Tetherin can be used to restrict VLP release as shown in Figure 1. Samples containing VLPs co-transfected with Tetherin have less detectable p24 Gag expression compared to VLPs co-transfected without Tetherin. In contrast, the cellular lysates exhibit detectable p24 Gag across all samples, irrespective of Tetherin expression. Rescue of VLP release can be observed in samples expressing increasing amounts of a Tetherin antagonist. Figure 1. 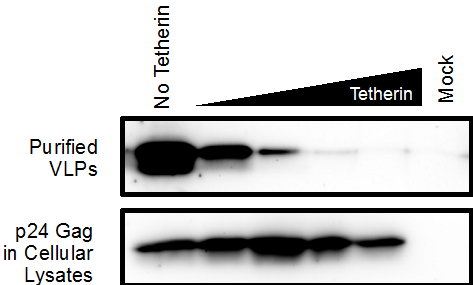 An immunoblot showing the effects of Tetherin on p24 Gag VLP production and release. In the top image, release of VLPs into the culture media is significantly decreased in the presence of Tetherin. However, production of p24 Gag in the cellular lysates is unaffected by increased Tetherin expression. Immediately prior to use, add complete Mini protease inhibitor to Triton X-100 Buffer at concentration suggested by manufacturer. This protocol was adapted from and recently used in Cocka and Bates (2012). Kaletsky, R. L., Francica, J. R., Agrawal-Gamse, C. and Bates, P. (2009). 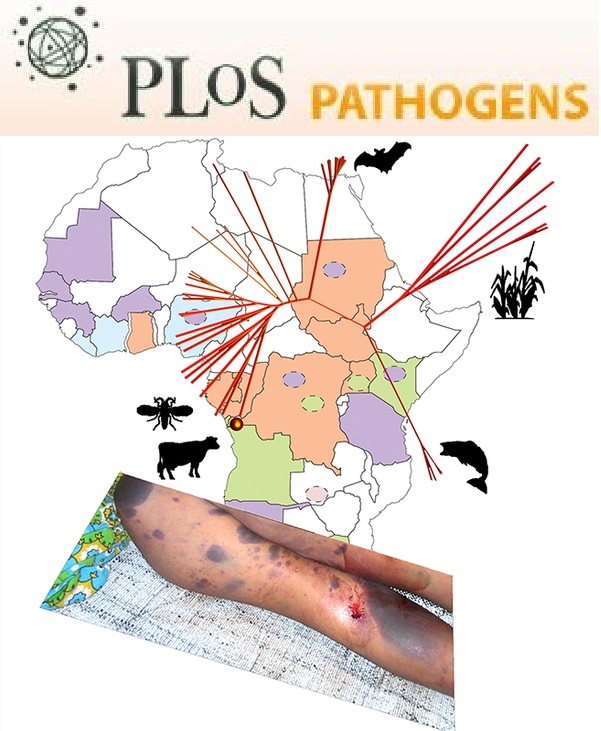 Tetherin-mediated restriction of filovirus budding is antagonized by the Ebola glycoprotein. Proc Natl Acad Sci U S A 106(8): 2886-2891. How to cite: Vande Burgt, N. H., Cocka, L. J. and Bates, P. (2013). HIV-1 Virus-like Particle Budding Assay. Bio-protocol 3(14): e830. DOI: 10.21769/BioProtoc.830.